Shannon Babcock Real Estate -Century 21 Creekside Realty (Proudly Serving Buyers and Sellers in Chilliwack, Agassiz, Harrison Hot Springs and Hope BC) : BRAND NEW LISTING!! 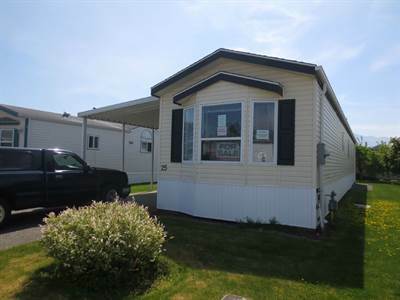 Manufactured Home For Sale in SARDIS!! Bring Your Offer Today on this "Former Showhome" right off the Quality Homes Lot! BRAND NEW (2008) Mobile with 30 Year Roof and Full 10 Year Home Warranty! BRAND NEW LISTING!! Manufactured Home For Sale in SARDIS!! Bring Your Offer Today on this "Former Showhome" right off the Quality Homes Lot! BRAND NEW (2008) Mobile with 30 Year Roof and Full 10 Year Home Warranty! Bring Your Offer Today on this "Former Showhome" right off the Quality Homes Lot! BRAND NEW (2008) Mobile with 30 Year Roof and Full 10 Year Home Warranty! Great layout and open concept with large windows, lovely colour scheme and finishings, spacious living room has bay window and decor fan, soaker tub in bathroom, Bright Big Kitchen with skylight, vaulted ceilings and all new appliances. Nice patio area, LARGE COVERED DECK and full carport on easy to maintain llovely ot. Situated in Prime Sardis Location with doctors, shopping, theater and restaurants all within walking distance, nearby Luckakuck Creek Trail and bus stop at road. This desirable 55+ complex has available rv parking and social clubhouse. READY FOR QUICK POSSESSION.